When I was practicing a bit of my hand balancing last week someone who practiced yoga commented on it and we started a conversation. 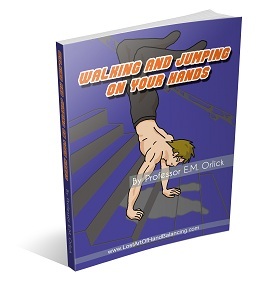 For any hand balancer is should not be much of a problem to get started. But if you need it you can always use a wall. Simply kickup into a forearm stand. From here all you do is bend your knees and bring your feet to your head. In this pose you want to keep your feet and knees together, though your body will naturally want to separate them. How far your feet can go depends on the flexibility of your back. For the contortionist is will be easy to touch the feet on the head or even bring them under the chin. If you can’t get there, not to worry, just do what you can and build from there. I just did a couple while writing this. Let me tell you this is one move that will instantly lift your spirits and make you feel alive.